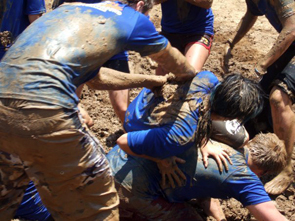 Slip and slide in a mud pit. Build a fort. Navigate a rope bridge. This is not your ordinary playground. For three decades, Irvine, California’s Adventure Playground has challenged kids, fueled their imaginations, and invited them to get their hands dirty. "Adventure playgrounds" have been around since World War II, when Theodore Sorensen, a Danish landscape architect, observed children's delight over playing with rubble and scraps. He imagined "a junk playground in which children could create and shape, dream and imagine a reality," taking risks in a controlled environment. In Europe today, there are around a thousand adventure playgrounds across the continent. How many adventure playgrounds are there in the United States? Three. And soon perhaps, two. The Adventure Playground in Irvine has been closed for two years now, due to the construction of a new community center at University Community Park. Residents had assumed it would reopen until they spotted a bulldozer sitting in the playground and learned that the city planned to demolish it. When confronted about the fact that a bulldozer is currently sitting in Adventure Playground at this moment, [Community Services head authority] Mr. Fisk remarked that the city’s initial intent was to demolish the entire site; but given the amount of community involvement in defending the site, there will be no demolition under further community dialogue takes place! To keep the playground open, the City of Irvine must address safety, accessibility, and maintenance issues, all of which will require resources that the city may not have at its disposal. Yet where there’s a will, there’s a way. With the dedication of the nearly 400 concerned citizens who have joined the fight to save this cherished playground, we remain hopeful that the city will find a way. Live in Irvine? Get involved here. Photos courtesy of Defend Adventure Playground. UPDATE: Victory! 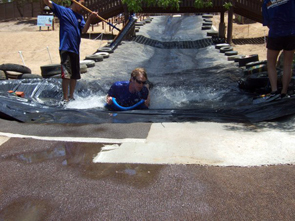 According to the Defend Adventure Playground blog, "the City of Irvine by the unanimous vote of the city council has officially appropriated $400,000 for the re-construction of Adventure Playground." The blog continues, "It’s time to put down the picket signs and put on the thinking caps. We have a playground to build. Long live the AP legacy!" Congratulations to the Irvine community for not only fighting the good fight, but for winning it!